And maybe you’ve been asking yourself that very question. The career of an artist, like that of an actor or musician, is not one that looks like the traditional careers that many of your friends will have. You are a creative individual, an artist, and you’ve always done things your way. 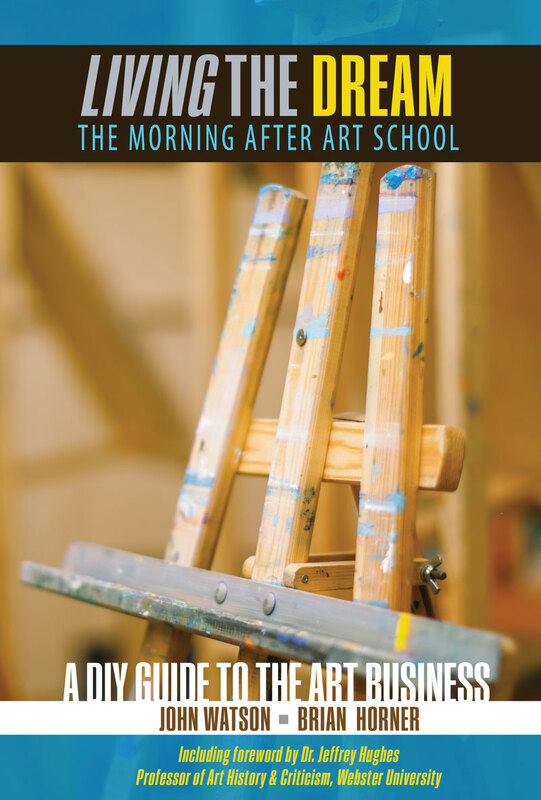 Designed to mimic the creative process of artists, Living the Dream...The Morning After Art School gives current or former art majors insights and tools to help navigate life as highly capable artists trying to put together a living from a variety of income streams. Living the Dream...The Morning After Art School exposes readers to creative ways of considering their career options. It uses terms familiar to the academic study of art, and in this way, a world that is foreign and overwhelming to many aspiring professional artists is brought easily and clearly into their comfort zone, equipping them for their quest to build a life doing what they love. Topics covered include planning, interpersonal skills, resume / website design tips, art exhibition skills, artist statements, and other important aspects of a career in the arts. CHAPTER 8 Self-Portrait – Living the Dream! John Watson is an artist and educator working in sculpture, installation, and drawing. He has a Master of Fine Arts from the University of Maryland and a Bachelor of Fine Arts from Webster University. Watson served on the faculty in the Leigh Gerdine College of Fine Arts at Webster University in St. Louis, MO from 2004-2012 and in the Department of Art at Belmont University in Nashville, TN from 2013-2016. He taught courses in sculpture, three-dimensional design, drawing, installation art, and artist professional practices. Working primarily with reclaimed wood, mostly salvaged from the cast-offs of trade and industry, building sites, or home remodeling projects, Watson builds objects and installations that reference the spaces and places of the built environment. He has been the subject of exhibitions at Vanderbilt University, Hemphill Fine Art in Washington, DC, Laumeier Sculpture Park in St. Louis, and Philip Slein Gallery in St. Louis, among others. Watson has curated and juried several exhibitions including Artist Collecting Art at Belmont University’s Gallery 121, Collective Reasoning at the St. Louis Artist Guild, and the I-70 Series: 5 Kansas City Artists at the Cecil R. Hunt Gallery in St. Louis. He has presented workshops, artist lectures, and has served as a guest critic at institutions including Vanderbilt University, The Mississippi College for Women, Laumeier Sculpture Park, Maryland Institute College of Art, Maryland College of Art and Design, and Northern Virginia Community College. He lives with his wife and son in Redwood City, CA, where he is fortunate to have the opportunity to work on his greatest project to date and is seriously thinking about taking up surfing. Brian Horner is the owner of Sound Artist Support, is CEO/CCO of Craft Brewed Music™, “the small batch streaming app,” and has served as Adjunct Professor of Saxophone at Austin Peay State University In addition to writing the first edition of this book, he is coauthor of Living The Dream…The Morning After Drama School and Living The Dream…The Morning After Art School, and presents music business and entrepreneurship lectures around the country. He is a graduate of the University of Michigan School of Music where he studied with renowned saxophonist and pedagogue Donald Sinta. Horner’s music business career has included stints with the Nashville Chamber Orchestra and Warner Bros. Records before the formation of his own company, Sound Artist Support, in 2008. SAS provides custom artist development and management to a diverse roster of world-class artists. He founded Craft Brewed Music™ in 2016. The music-streaming app provides a cross-genre home for music and artists often overlooked by the mainstream. Brian Horner is a D'Addario Woodwinds Performing Artist endorsing Grand Concert Select reeds and a Conn-Selmer Artist endorsing Selmer (Paris) saxophones, and endorses Hercules Stands. He lives in Nashville with his wife and daughter, dog, and cat.